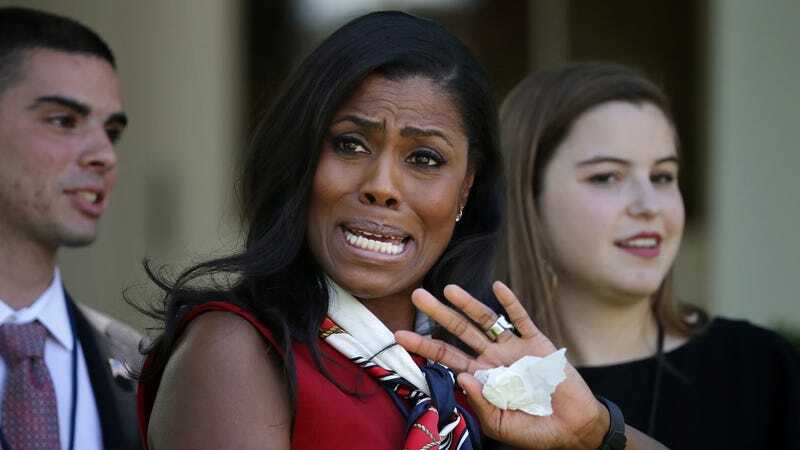 Omarosa Manigault might have been dragged out of the White House, but we will never be rid of her, just as we will truly never be rid of warmed-over vampires like Rudy Giuliani and Newt Gingrich. But while those two languish somewhere at the bottom of the swamp, waiting for yet another relic from the 1990s to rise to political prominence, Omarosa will bide her time in the mosquito-replete marsh waters of reality television, having been added to the cast for the upcoming season of Celebrity Big Brother. Per the Hollywood Reporter, the former Apprentice star—who, according to some reports, was fired last month by White House Chief of Staff John Kelly and had to be escorted off the premises after acting “very vulgar” and “curs[ing] a lot,”—will join the likes of Real Housewife Brandi Glanville, Sugar Ray frontman Mark McGrath, actress Marissa Winokur, and E! correspondent Ross Mathews on CBS’s winter season of Celebrity Big Brother. Certainly, this will go very well. Other celebrities blessed with the opportunity to spend two-plus weeks locked in a house with Omarosa include Metta World Peace, James Maslow, Keshia Knight Pulliam, Chuck Liddell, and Shannon Elizabeth. The season kicks off on February 7 and ends on February 25, which is just enough time for me to locate a remote island from which I will never have to hear about any former Trump White House staffers ever again, no matter how much money television networks attempt to milk from every single one of them.